Paso Robles is questioning Justin Winery’s recent clear-cutting of oak groves. When I started my journalism career as a proofreader at The Santa Barbara Independent back in 1999, I regularly edited news articles about Kendall Jackson cutting down nearly 900 oak trees near Los Alamos in order to make room for more vines. There was nothing illegal about the chopping, but that made it even more controversial, enraging Santa Barbara’s powerful environmentalists and pitting nature-loving winemakers like regional pioneer Richard Sanford against larger, “out-of-town” producers like K-J. An oak tree protection ordinance was eventually passed, and K-J has gone on to become a leader in sustainability, even winning accolades from the EPA. But the ripples of that clear-cutting are still felt today. It’s the easiest example for wine industry critics to bring up when fighting for tougher regulations on further winery and vineyard development. It’s also a persistent sword against the claims of vintners who usually are (or at least try very diligently to appear) as eco-minded as a farmer can be. Those arguments are all very poignant today, as the County of Santa Barbara works toward revising its winery ordinance, with the next meeting scheduled for June 22. Last week, nearly two decades later, an eerily similar controversy exploded up the coast in San Luis Obispo County. In the bucolic hills of Paso Robles, the parent company of Justin Winery was discovered to have clear-cut hundreds of oak trees and other native brush as part of a reservoir project. The move was publicized in part by Matt Trevisan of the nearby Linne Calodo Winery, who noticed the barren hills while flying over the property and then used Google Earth maps to show how much had been removed. The raw images are startling—one observer said it looked like a “strip mine”—and the work was quickly lambasted by many winemakers as well as neighbors, one of whom says his fourth generation farm’s future is threatened by the potentially disastrous impacts to the watershed. This isn’t the first time a winery removed oak trees to make way for grapevines, and it won’t be the last. And I don’t know much about what it takes to make a global agriculture brand like Justin work. But I do know from covering both the wine industry and the environmental movement that this controversy could reverberate for years. 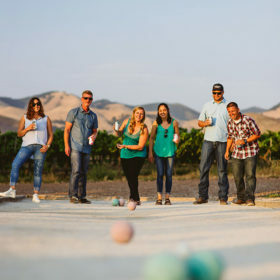 There’s potential immediate harm to profits, as some winemakers and environmentalists are calling for a boycott of anything connected to The Wonderful Company. That’s the parent company of Justin owned by Fiji Water founders Stewart and Lynda Resnick, whose portfolio also includes Landmark Vineyards, the pomegranate juice brand POM, and many other subsidiaries. But it’s unlikely that will have much effect on the $2 billion company’s bottom line. There’s also damage to Justin’s image, at least within the Central Coast, where many vintners grumbled when founder Justin Baldwin sold to the Resnicks in 2010. Much of that was just the usual griping that comes when a brand supposedly “sells out” — can your really fault someone for building a successful company and then selling it for a profit? — and others thought quality would suffer as quantity grew. But today’s Justin wines remain delicious and very much in line with the rich style that put the winery and Paso Robles on the map. Indeed, we awarded Justin as American Winery of the Year in 2015 for that consistency. Many were also concerned that the Resnicks’ deep pockets and water-savvy ways would wind up hurting everyone else and changing the face of Paso Robles wine. That all sounds like paranoia, at least until something like this happens. The most enduring impacts, however, are likely to be felt by the greater Paso Robles wine community. Aside from the internal conflicts this is festering and the oak ordinance that’s already coming full speed ahead, the clear-cutting has caught the attention of environmentalists across California. Expect much more scrutiny in the months and years to come, as well as potential lawsuits when the scrutiny is deemed not probing enough. And all this comes in the same month that the Paso Robles Wine Country Alliance should be touting a study that revealed $1.9 billion in regional economic impacts. This is not a new debate overall in the wine world: wineries and vineyards walk a fine line between extolling the virtues of nature and terroir while also having to sacrifice some of that nature for the sake of growing grapevines. The challenge continues to be balancing growth and conservation. It will certainly be interesting to see how this current debate plays out and what it means on the grand scale for the region and state as a whole.